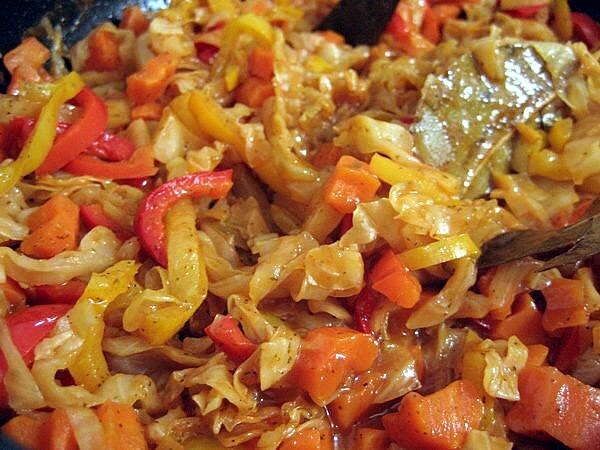 Vegetable stew because of the variety of vegetables has different variations. Can be used as an ingredient in cabbage. And not only white, but also cauliflower, kohlrabi, and broccoli. - salt, ground pepper, spices and condiments – to taste. Prepare the ingredients. Thin strips slice the cabbage. Slice the potatoes, zucchini, carrots, and onion cubes. Finely chop the garlic. Pour over boiling water tomatoes, remove the skins and cut into large cubes. Put on the fire a pot. Put on the bottom of the pan with layers of sliced potatoes, cabbage and carrots. Pour the product with water and simmer on low heat for ten minutes. Add the tomatoes and zucchini, spices, salt. If required can add water. Saute the vegetables for another five minutes. Separately fry onions in vegetable oil. Put the onions in the vegetables. Leave the stew on low heat until tender. When the vegetables are ready, turn off the stove, stir in the garlic and cover the pan with a lid for steeping. Divide the cabbage on individual plates. Boil the leaves in lightly salted water, drain. In a pan brown thinly sliced onions, stir in the rice, let it obzharitsya, turn off the gas. Put in the rice, chopped green onion, parsley, grated cheese, chopped eggs, salt, pepper. Mix. Prepare a baking sheet, greased with oil. Layers put on the plate of the cabbage leaves and mix with rice. The top layer should be cabbage leaves. Pour the stew of hot water and put in the oven. Bake the dish until tender. Beat eggs and add grated cheese. Pour the egg mixture into the stew and allow to bake until completely cooked through. Cut into large cubes potatoes, boil it until soft. Add finely shredded cabbage and diced carrots. In a frying pan in vegetable oil fry onions, add sliced mushrooms, salt, pepper. Put sauteed mushrooms to the vegetables, stir, bring the stew to a boil, reduce heat and leave to stew until ready. Before serving the dish to decorate with greens.